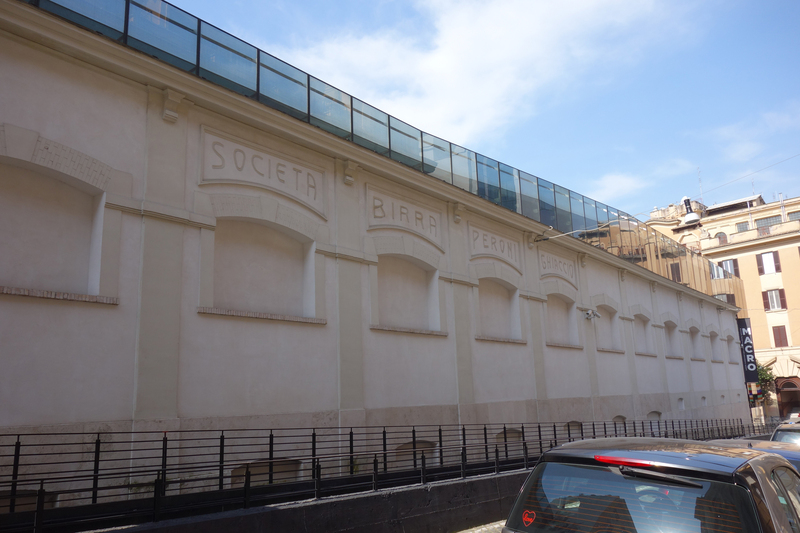 Rome might not be the obvious place to go looking for industrial buildings, but there are a few, including the old Peroni factory (1909, architect Gustavo Giovannoni) which stands a little way north of the main railway station (Termini). It ceased to brew in 1971 and was converted to one of the sites of the city’s Museum of Contemporary Art (MACRO) during the 1990s. Later a glass roof was added connecting the two blocks of the works, covering over the old brewery yard. The yard entrance (on the opposite side to this photo) has the word ‘scuderie’ on the archway; google translate tells me this means ‘teams’ – teams of horses? Or?? Need more research! This entry was posted in Breweries, Industrial architecture and tagged beer, Italy. Bookmark the permalink.